Loose objects in the driver’s foot area could interfere with the operation of the foot pedals, possibly causing an accident. Do not place anything under the front seats. When you return the seatback to its upright position, hold the seatback and return it slowly and be sure there are no other occupants around the seat. If the seatback is returned without being held and controlled, the back of the seat could spring forward resulting in accidental injury to a person struck by the seatback. Riding in a vehicle with a front seatback reclined could lead to serious or fatal injury in an accident. If a front seat is reclined during an accident, the occupant’s hips may slide under the lap portion of the seat belt applying great force to the unprotected abdomen. The protection of your restraint system (seat belt and air bags) is greatly reduced by reclining your seat. Serious or fatal internal injuries could result.The driver must advise the front passenger to keep the seatback in an upright position whenever the vehicle is in motion. Do not use a sitting cushion that reduces friction between the seat and passenger. 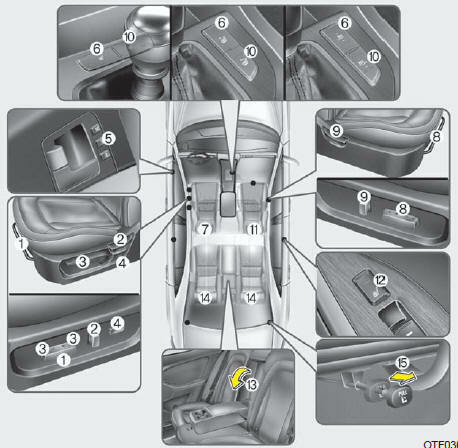 The passenger's hips may slide under the lap portion of the seat belt during an accident or a sudden stop. Serious or fatal internal injuries could result because the seat belt can't operate normally. Never attempt to adjust seat while the vehicle is moving. This could result in loss of control, and an accident causing death, serious injury, or property damage. Do not allow anything to interfere with the normal position of the seatback. Storing items against a seatback or in any other way interfering with proper locking of a seatback could result in serious or fatal injury in a sudden stop or collision. Always drive and ride with your seatback upright and the lap portion of the seat belt snug and low across the hips. This is the best position to protect you in case of an accident. In order to avoid unnecessary and perhaps severe air bag injuries, always sit as far back as possible from the steering wheel while maintaining comfortable control of the vehicle. It is recommended that your chest is at least 250 mm (10 inches) away from the steering wheel. After adjusting the seat, always check that it is securely locked into place by attempting to move the seat forward or reverse without using the lock release lever. Sudden or unexpected movement of the driver's seat could cause you to lose control of the vehicle resulting in an accident. Do not adjust the seat while wearing seat belts. Moving the seat cushion forward may cause strong pressure on the abdomen. Use extreme caution so that hands or other objects are not caught in the seat mechanisms while the seat is moving. Do not put a cigarette lighter on the floor or seat. When you operate the seat, gas may gush out of the lighter and cause fire.